This week's tablehopper: Greece is the time, is the place, is the motion. This happened often on #fetatrip. This was after our tour of the A.S. Kalavryton cooperative, enjoying lunch at To Spiti tis Marios in Kalavryta. Photo: © tablehopper.com. Kalispera! 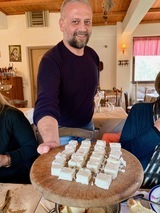 I’m back from a couple magical weeks in Greece, where I learned all about Greek PDO (protected designation of origin) feta, and tasted it at every meal for about six days. Let’s just say I have an entirely new perspective on one of my favorite cheeses, and I’m on the hunt for any barrel-aged PDO feta we can find! (If you have a shop in the Bay Area—or know one—selling barrel-aged PDO feta from Greece, please drop me a line—I heard Cheese Plus in SF has some!) I’ll be writing more about all things feta soon—and I know a bunch of you were following along at @tablehopper—but in the meantime, you can take a look at some of the dishes our group tried in this Planet Cheese post from Janet Fletcher. I also spent a week in Athens on my own, touring incredible ruins and museums daily, trying a bunch of souvlaki, seafood, natural wines, Greek yogurt (sheep’s milk, baby! ), I fell in love with trahana, and got my daily fill of Greek coffee and frappés. Thanks to everyone who sent recommendations! It was a truly incredible trip—the Greeks were so hospitable and kind, and who knew late March would be so idyllic? Spring had sprung in Athens, and I soaked up every wildflower and all the rays of sunshine. I also returned home with one of my heaviest bags yet. Shout-out to Athena for protecting my suitcase from the beagle at Customs. Before we dive into today’s catch-up issue, I wanted to be sure you saw this piece that posted just before I left town that I wrote on the women blazing San Francisco’s canna-culinary scene. Yes, it was a fun piece to research. There are some talented women you should know about in that article! I was also so pleased to be included in George McCalman’s latest “Observed” column, featuring Zuni’s magnificent 40th birthday celebration. Pop! Big congrats to all the local talent included in the 2019 James Beard Foundation Award nominees! The Awards Gala will take place on Monday May 6th! Okay, that’s it for announcements, let’s jump in! The dining room at Palette. Photo: Rob Williamson, courtesy of Palette. Tony’s tartare. Photo: Marija Vidal/Ghost Media Inc.
Now open in SoMa is ~PALETTE~ from chef-owner Peter J. Hemsley, previously a sous at Quince, who trained in Paris, including time with Alain Passard (L’Arpege). His menu of creative California cuisine includes the Palette flatbread, Monterey globe artichoke fries, housemade kielbasa, and a whole spit-roasted chicken (the press release said “farm hen,” but I just can’t do it) from the restaurant’s brick oven and rotisserie. Expect: seasonal, local, casual, shareable. 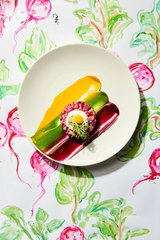 Helmsley also has artistic leanings (illustration, watercolor, ink on paper), and it will come across in his plating. There is also a strong art component, with an art gallery and retail store with a ceramic studio (house ceramicist Andrew Kontrabecki even creates special wares for specific dishes). Look for artwork from local artists that highlights concepts related to food culture. The current exhibit is “As You See It,” from Bay Area artists Juliette Choné and Kelley O’Leary. There’s a bar featuring wine and Champagne from small and sustainable producers, aperitifs, and craft beers. Interestingly, the original designer-architect Cass Calder Smith (CCS Architecture) updated the space for Palette—LuLu was Smith’s first restaurant project 25 years ago. He will also be designing the permanent space for Palette, due to open in a year or so, at 155 12th St. Open for lunch and dinner Mon-Fri 11am-8pm. 816 Folsom St. at 4th St. 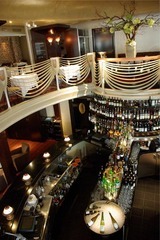 The loungey style of the dining room at Commons Club. Photo: © tablehopper.com. Duck agnolotti at Commons Club. Photo: © tablehopper.com. 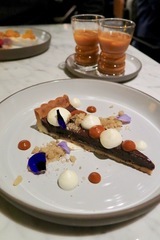 Chocolate ganache tart with Thai iced tea at Commons Club. Photo: © tablehopper.com. Little Gem on Union. Photo: Little Gem. Grem’s Good Dog. Photo by owner via Yelp. Just before I left town, I was invited to a preview dinner at ~COMMONS CLUB~, the new restaurant inside of the new Virgin Hotels San Francisco in the Yerba Buena District in SoMa (the second to open, the first was in Chicago). The space is pretty shag-tastic—there’s The Shag Room, for a loungey vibe with your cocktails (which all nod to Virgin’s musical origins) and a busy bar. There’s a spacious dining room, with an easygoing, low-slung look: it has a very living room-meets-dining room style, with clubby, mid-century-esque tobacco leather chairs and round tables surrounded with dining tables and banquettes around the perimeter (it makes for a unique kind of seating arrangement). A rooftop bar is opening soon as well. There’s a daytime (7am-10:30am and 11:30am-2pm)—a good spot for any morning or lunch meetings—and dinner menu, served 5:30pm-10pm (until 10:30pm Fri-Sat); there’s also a bar menu 2pm-10pm. Chef Adrian Garcia was most recently chef de cuisine at Quince, and fortunately some of his stuffed pasta prowess is on display here, with dishes like striped tortelloni (from cocoa powder and egg yolk) with wild mushroom and Swiss chard ($23), and plump duck confit agnolotti, with notes of orange, grana padano, sage, and fried duck skin crumble on top ($26). Appetizers like crudités ($15) sound boring, but don’t be deceived: a cloud of buttermilk topped with almond and dill oil arrives with an array of gorgeous vegetables, and fish and chips ($20) is actually a hamachi crudo you scoop up with chips made of dehydrated fish skin (plus squid ink). Parker House rolls, always a crowd pleaser. Mains include roasted cauliflower and Israeli couscous ($22) with the ability to add a supplement of Don Watson lamb ($20), plus there’s black seabass with fish fumé ($27), and I loved the pairing of Thai iced tea with the chocolate and espresso ganache tart for dessert. I’ll be posting more pics on @tablehopper later today! There is quite the squad of talent in the kitchen here, so don’t write it off as “just a hotel restaurant.” (Although I do think their wine list could use some better curation.) 250 4th St. at Folsom. A second, 70-seat location of Eric Lilavois and Dave Cruz’s ~LITTLE GEM~ has opened in Cow Hollow in the former Umami Burger. The menu is similar to their Hayes Valley spot, with a couple new dishes (including their oft-requested, gluten-free fried chicken). They’re opening tonight (April 2nd) with dinner service only (full service, not fast-casual/order at the counter), but ramping up quickly for breakfast, lunch, and weekend brunch soon. The menu is designed for omnivores, herbivores, and keto, paleo, vegan, and gluten-free diets—so, basically, anyone is welcome. Wine, beer, and non-alcoholic beverages are also available. Check out their Little Gem Pantry, a retail section that features packaged versions of ingredients the kitchen uses, including bacon-coconut crumble, cashew butter, and seasonal jam. Open Tue-Thu 5pm-9pm, Fri-Sat 5pm-10pm to start. 2184 Union St. at Fillmore. After opening a few weeks ago and then experiencing a brief closure, ~BURMA CLUB~ officially reopens tonight (April 2nd) in Mint Plaza. To recap, it’s the latest restaurant from co-owner Desmond Tan’s Burma Superstar group, in the long-shuttered Oro space at Mint Plaza. They haven’t posted hours or a menu on their site, but they are open nightly for dinner (possibly starting at 5pm, if an older post is correct). No reservations. 8 Mint Plaza at Jessie. I mentioned this project earlier, but you should know that ~EL LOPO~ is now open on Polk, a Spanish-inspired, food-forward wine bar (through a California lens), with dishes like Galician-style empanadas with romanesco and smoked ham and springtime tacos (to start—things will be ramping up in coming weeks). Hours are Sun-Thu 4pm-12am and Fri-Sat 4pm-2am, with the food menu running from 5pm-10pm. 1327 Polk St. at Bush, 415-237-3072. There’s a new drive-thru hot dog spot, and it looks pretty good! Take a peek at ~GREM’S GOOD DOG~, which opened in the parking lot of Smart Foodservice Warehouse, right by Discount Builders. You’ll find a Coney Island-style hot dog, Polish, jalapeño cheddarwurst, and more, all $8 and under. Open daily 11am-11pm. 170A S. Van Ness Ave. at Plum. Housemade ‘nduja at Che Fico. Photo: © tablehopper.com. Moving into the former (and recently closed, sniff sniff) Yuzuki space in the Mission will be ~AL’S DELI~, a casual restaurant/sandwich shop from Aaron London of nearby AL’s Place. The Chronicle reports he’s going to integrate some influences from New York and Montreal delis, plus Israeli street food, all with his own creative and innovative spin, of course. Think stuffed latkes, salads, sandwiches, sides, and large-format platters. Look for a summer opening (and more details soon). In the meantime, did you know the patio is now open at AL’s? Now you do. 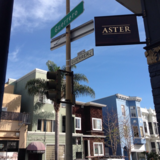 598 Guerrero St. at 18th St.
Eater also reports ~BARZOTTO~ is expanding to North Beach in the former Caffe DeLucchi, bringing its fast-casual format and $10/$40 wine model, possibly by the fall. 500 Columbus Ave. at Green. A new project is in the works from Rachel Sillcocks (previously Range, Piccino) and Kristina Compton (Avery, Atelier Crenn, Range), ~HILDA AND JESSE~, an “all-day breakfast restaurant and neighborhood hangout,” with an all-day menu that will go into late afternoon. Ends up they are (fellow) breakfast obsessives, and are working on opening a place in San Francisco (they’re scouting locations). They’re also presently seeking investors, and in the meantime, are hosting some pop-ups, starting with their first one on Thursday April 11th at Robberbaron (2032 Polk St. at Broadway). It will run from 6pm to 10pm, and they’ll be serving two Latvian-style, rolled pancakes (as they say, “think ‘Hot Pocket’ but way tastier!”), a savory one and sweet one, $9 each. Swing by, get a glass of wine, and have some pancakes. The next pop-up will be on April 22nd, at Nightbird. 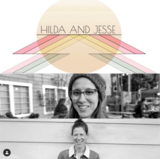 They’re going to be featuring a fun tasting menu brunch when they open Hilda and Jesse, which they’ll be playing around with at their second pop-up (four courses for $45). Look for playful takes on comfortable classics, and also dishes inspired from their family backgrounds (look for a lot of Latvian and Eastern European influences). Keep track of future pop-up details at @hildaandjessesf. The iconic red exterior of Chow on Church. Yelp photo by B.H. 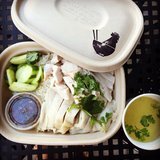 Khao man gai from Rooster & Rice. Yelp photo by JP N.
Whoa, the Castro has a bunch of news, starting with the sad and sudden closure of ~CHOW~ on Church, after 22 years in its original location. I didn’t think it looked very hopeful when they limited their hours in January, and sadly that proved to be the case. Chow has fed so many of us over the years, it’s hard to believe it’s gone. Another old-timer has closed: ~FIREWOOD CAFE~, which has been open since 1997 (and to be completely honest, it felt like it, but yes, it has fed a bunch of folks affordably for a long time). [Via Hoodline.] 4248 18th St. at Diamond. The groovy The Temple Club has closed in Oakland. Yelp photo by owner Geoffrey D..
Paper Rooster’s Emperor: Chinese roast chicken, crispy chicken skin, housemade dill pickles, hoisin mayo, spring onions. Photo courtesy of Paper Rooster. Just as I got home, this big news hit my inbox: chef Traci Des Jardins is closing ~JARDINIÈRE~ after service on Saturday April 27th, after 21 years as our bastion of bubbles, charcuterie, and fine dining in Hayes Valley. You can read more in this in-depth interview about chef Traci’s reasons, memories, and perspective, but in sum, instead of remodeling or reconcepting to fit SF’s changing (and costly) current dining landscape, she decided to close the restaurant. In this The New York Times piece, she also mentions being fatigued with fine dining, and is more interested in focusing on Mexican cuisine right now. Right on. I know many of us are going to miss sidling up to that shimmering horseshoe bar, one of the city’s sexiest, and Jardinière’s high level of hospitality and quality service will be so missed—such a great staff. Des Jardins and her team are dedicated to ensuring that each staff member finds a new place to work where they will thrive. Kudos to chef Traci, who has had so much talent come up and out of her kitchen, including chefs Douglas Keane, Peter Armellino, Richard Reddington, Michael Hung, Robbie Lewis, Elizabeth Binder, Deepak Kaul, as well as bar directors Thad Vogler and Elizabeth Takeuchi-Krist; sommeliers Eugenio Jardim and Jai Wilson; general managers Doug Washington and Anna Corporeal—the list of Jardinière alumni is long (you can only imagine how busy the closing parties will be). She will continue to be busy with her other properties throughout the city, including The Commissary and Arguello in partnership with The Presidio Trust, Mijita, School Night, and Public House. I need to come in for one last warm bread salad (and thankfully it’s artichoke season). Best wishes to her and the entire team, thanks for all the memories and creating a place for so many celebrations. I heard from a tablehopper reader that the popular Vietnamese restaurant in Oakland, ~THE TEMPLE CLUB~, has closed. (I was seeing the retaurant location listed in a real estate newsletter, and hoped the writing wasn’t on the wall, but alas, the inside is reportedly all torn up.) Owners Geoff Deetz and his wife Quynh Nhu are looking for another location, here’s hoping we get a positive update soon (I reached out to Geoff for an update). 2307 International Blvd. at 23rd Ave., Oakland. 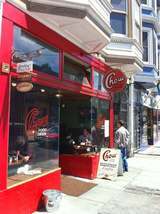 More closures: unfortunately, Chinese-American sandwich spot ~PAPER ROOSTER~ has closed their Tenderloin shop, here’s hoping they return in some form. A tablehopper reader let me know the Vietnamese and Chinese ~KIM THANH~ has closed, an unpretentious spot known for its seafood in the Tenderloin. After 32 (or 37!) years—I have read conflicting numbers—the owner has retired. At least they made it through one more crab season for us. 607 Geary St. at Jones. I also heard back from one of the owners of ~COLETTA GELATO~: “It looks like we are going to sell part of the company, but not the name. This means that Coletta will be permanently closed.” Sorry, everyone! And this is just a temporary closure (thank goodness): ~NAMU GAJI~ is closed for a mandatory seismic retrofit of their building at 499 Dolores St. (just like their neighbors, Bi-Rite Creamery). They will continue catering and Caviar to-go orders throughout the closure over the next couple months, and you can get your Namu fix at Namu Stonepot at 553 Divisadero St. and Namu at the Ferry Building. The sign at Aster. Photo via Instagram. Executive chef Steve Brown slicing up some meat magic. Photo: © tablehopper.com. Another surprise: chef Steve Brown, the opening chef of ~NIKU STEAKHOUSE~ (with “A5” tattooed on his forearm), has returned to San Diego to be with his family. (He has started his Cosecha SD dinners back up, in case you want to check them out!) Taking over as executive chef is Dustin Falcon, who joined Niku prior to opening as executive sous chef. He was most recently at Lazy Bear as a sous chef, and The French Laundry as chef de partie. 61 Division St. at Rhode Island. (Sponsored): Meet Surfacehaus. We've Got the Surfaces for Your Next Photo Shoot. Do you photograph or style food, maybe products? Are you a publicist, a blogger, or a chef who likes to photograph your dishes? Increase the impact of your images with the right surfaces and backgrounds. Surfacehaus specializes in photographic surfaces. Join companies such as Williams-Sonoma, Equator Coffee, and Sunbasket, who have all rented from our collection of 80-plus pieces, or have your dream surface custom made. Visit surfacehaus.com for more information. Mention tablehopper for a 20 percent discount on your first rental, and 10 percent off your first custom order. Locations in San Francisco and Berkeley. To make it easy for you, we also deliver throughout the Bay Area. Boozy ice cream cones at Candy Bar. Photo: William Walsh @wdwphoto. The creative minds behind 98 Turk (the bespoke Tenderloin bar also known as Biig) have opened their latest venture in an adjoining space and room: ~CANDY BAR~. I came by 98 Turk recently for some cocktails and bar manager Ronnie Buders gave me a sneak peek of their sugar- and booze-filled fantasia. Bring on the striped walls and creepy candy store ephemera, with weird figurines and yes, clowns. 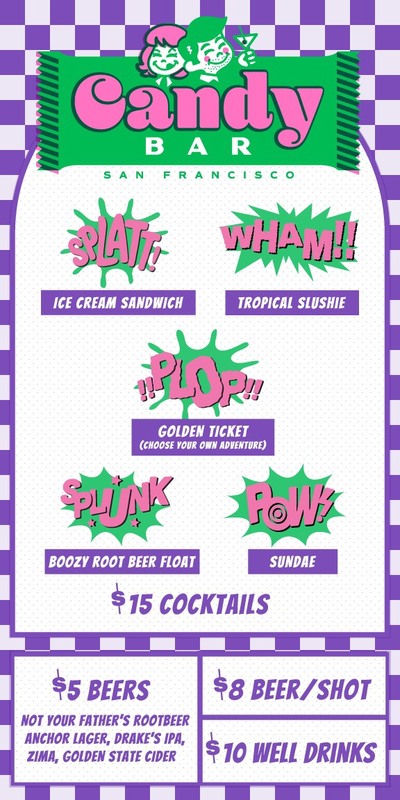 The menu features a wild intersection of dessert and booze, with cocktails named Splatt! (ice cream sandwich), Wham!! (tropical slushie), Splunk! (boozy root beer float), or a !!Plop!! golden ticket (choose your own adventure). They’re also making boozy ice cream, like Elyx banana piná, Kikori Mexican chocolate, Bertoux strawberry, and Yuzuri orange marmalade. Order the Pow!! and you’ll get an ice cream sundae, featuring two flavors of boozy ice cream and two boozy toppings (Old Overholt pumpkin spice caramel sounds amazing), topped with your choice of treats. 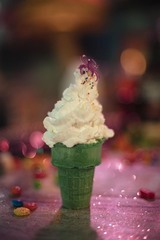 Or just get some boozy ice cream in a cone. You can also get well drinks, beer and a shot, and more. Open Thu-Sat 6pm-12am, no reservations needed; enter through their NvrOvr 94 Turk store. 94 Turk St. at Taylor. State Bird Provisions and The Progress are seeking experienced and qualified dining room team members, including both servers and hosts. State Bird Provisions strives to consistently provide a unique environment where people can expect interesting, high-quality, creative food, and meaningful service. To learn more about this opportunity, follow the link. The Monk’s Kettle, SF’s premium craft beer tavern located in the Mission, is seeking an executive chef to lead all kitchen operations. After 11 years in operation, we have a solid operation and are seeking a qualified candidate to maintain proper execution with a veteran crew. Chef must be properly trained in culinary techniques and food safety. Chef must possess and exhibit strong managerial skills. Duties not limited to but include execution of menu (oversee prep, recipes, and cost); training and staff reviews; ordering and inventory; events. Please contact Christian and see the entire job post here. Cockscomb is a celebration of San Francisco’s diverse culinary heritage and homage to chef Chris Cosentino’s adopted city. The menu features selections from the restaurant’s oyster bar and wood-fired oven, coupled with a dynamic beverage program composed of Cosentino’s favorite gins, cocktails, beers, and ciders. Cockscomb pays tribute to the city’s fresh and native flavors, as well as Cosentino’s expert offal cookery and butchery. To learn more about this opportunity, follow this link. All content © 2019 tablehopper, LLC. I am more than happy if you want to link to my reviews and content elsewhere (thanks, glad you dig it), but republishing any part of them in any way, shape or form is strictly prohibited until we talk first. Please take a look at my Creative Commons license for more detail.